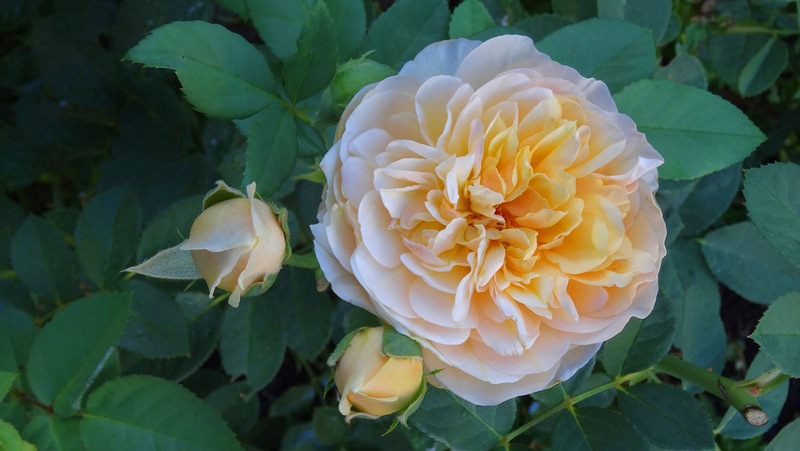 'Troilus' is a David Austin old-fashioned rose with beautiful, large, deeply cupped blooms of a wonderful shade of honey-buff colour on a strong growing bush with mid-green foliage. It is a fragrant rose that performs outstandingly well when grown in a warmer climate. Troilus was released by David Austin in 1983. It was named after the Trojan War hero in Shakespeare’s tragedy, 'Troilus and Cressida'. The Troilus rose flowers continuously from spring to late autumn. It is a sturdy, upright shrub of medium height. Symphyotrichum novi-belgii also known as New York Aster is the type species for Symphyotrichum, a genus of the family Asteraceae whose species were once considered to be Asters. They are ornamental plants native to Canada and the United States. 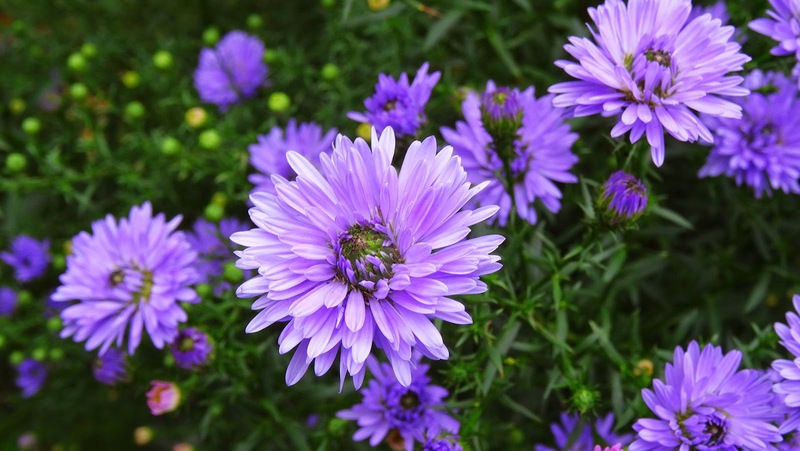 All of these plants are collectively and popularly known as "Michaelmas daisies". The variety 'Peter III Blue', shown here, is an autumn blooming, double flowering lilac-blue aster that provides a stunning number of blooms around the Southern Hemisphere Easter time (April). Α HAPPY EASTER, PEACEFUL PESACH & ΚΑΛΟ ΠΑΣΧΑ TO ALL! Lantana is a genus of about 150 species of perennial flowering plants in the verbena family, Verbenaceae. They are native to tropical regions of the Americas and Africa but exist as an introduced species in numerous areas, especially in the Australian-Pacific region. The genus includes both herbaceous plants and shrubs growing to 0.5–2 m tall. Their common names are shrub verbenas or lantanas. Some species are invasive, and are considered to be noxious weeds, such as in South Asia, Southern Africa and Australia. In the United States, lantanas are naturalised in the southeast, especially coastal regions of the Carolinas, Georgia, Florida, and the Gulf Coast. The generic name originated in Late Latin, where it refers to the unrelated Viburnum lantana. Lantana's aromatic flower clusters (called umbels) are a mix of red, orange, yellow, or blue and white florets. Other colours exist as new varieties are being selected. The flowers typically change colour as they mature, resulting in inflorescences that are two- or three-coloured. "Wild lantanas" are plants of the unrelated genus Abronia, usually called "sand-verbenas". 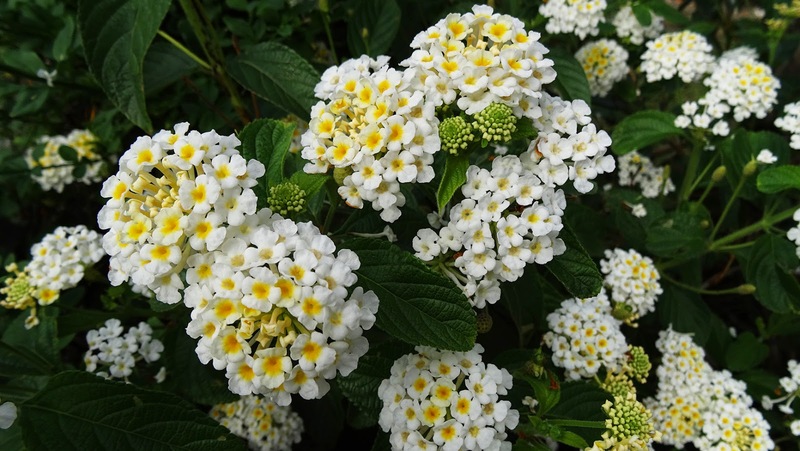 Lantana camara blanca, shown here is a small perennial shrub which can grow to around 2m in height and forms dense thickets in a variety of environments. It has small tubular shaped flowers, each of which has four petals and are arranged in clusters at the end of stems. Flowers are yellow and white and after pollination occurs the colour of the flowers change (typically from yellow to white); this is believed to be a signal to pollinators that the pre-change colour contains a reward as well as being sexually viable, thus increasing pollination efficiency. Pelargonium is a genus of flowering plants which includes about 200 species of perennials, succulents, and shrubs, commonly known as geraniums (in the United States also storksbills). Confusingly, Geranium is the correct botanical name of a separate genus of related plants often called cranesbills or hardy geraniums. Both genera belong to the family Geraniaceae. Linnaeus originally included all the species in one genus, Geranium, but they were later separated into two genera by Charles L’Héritier in 1789. 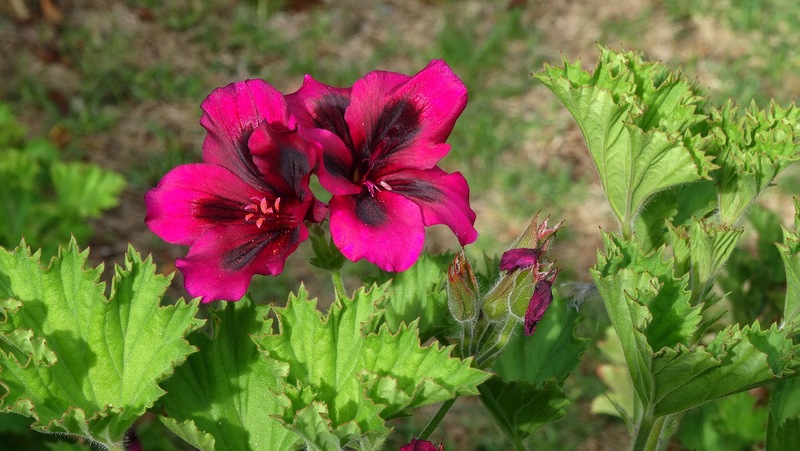 Pelargonium species are evergreen perennials indigenous to Southern Africa, and are drought and heat tolerant, but can tolerate only minor frosts. They are extremely popular garden plants, grown as bedding plants in temperate regions. Regal (Royal, French) varieties or Pelargonium × domesticum are mainly derived from P. cucullatum and P. grandiflorum. They have woody stems, wrinkled leaves and pointed lobes, and are mainly grown in greenhouses. The cultivar shown here is Regal Elegance Burgundy (Pelargonium x domesticum).